Ferncliff Cemetery and Mausoleum is located at 280 Secor Road in the hamlet of Hartsdale, town of Greenburgh, Westchester County, New York, about 25 miles (40 km) north of Midtown Manhattan. It was founded in 1902, and is non-sectarian. Ferncliff has three community mausoleums including columbariums, a crematory, a small chapel, and a main office located in the rear of the main building. 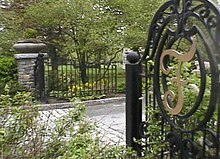 Ferncliff Cemetery has three community mausoleums that offer what The New York Times has described as "lavish burial spaces". This cemetery include columbariums. As of 2001, a standard crypt space in the mausoleums was priced at $15,000. The highest-priced spaces were private burial rooms with bronze gates, crystal chandeliers, and stained-glass windows, priced at $280,000. The Ferncliff Mausoleum, aka "The Cathedral of Memories", is the cemetery's oldest mausoleum, constructed in 1928. It has classic architecture, but the corridors are dark without glass panes to admit natural light. Ed Sullivan and Joan Crawford are two of the most famous interments in the main mausoleum. The Shrine of Memories is Ferncliff's second mausoleum and was constructed in 1956. "Shrine of Memories" is a more contemporary structure than "Ferncliff Mausoleum." It has many panes of glass to admit natural light, and there is a painting of Christopher Columbus in the main hall of the building. Basil Rathbone is one of the most famous interments in "Shrine of Memories." Rosewood is Ferncliff's most recently completed community mausoleum, having been constructed in 1999. Joseph J. Mangan was the architect of Rosewood. Aaliyah and her father Michael Haughton have a private room in Rosewood. Cab Calloway is interred with his wife Zulme "Nuffie". The cemetery is also known for its in-ground burials in sections located in front of the mausoleums. Ferncliff is one of the very few cemeteries that does not permit upright headstones in its outdoor plots. All outdoor grave markers are flush with the ground. This feature facilitates maintenance of the cemetery grounds. However, there are several upright headstones that were placed before this policy was instituted. Malcolm X and the most famous ground burials, in plot Pinewood B.
Ferncliff Cemetery has the only crematory in Westchester County, New York, and performs approximately 10% of the cremations in New York State. Because of local ordinances, no additional crematories can be constructed in Westchester County. Diane Arbus (1923-1971), artistic photographer noted for photographs of marginalized people considered ugly or surreal. Alan Freed (1921–1965), radio DJ known as "The Father of Rock & Roll". His ashes were moved to the Rock and Roll Hall of Fame in 2002. Jim Henson (1936–1990), Muppets creator. His ashes were scattered at his Santa Fe, New Mexico, ranch. Nelson Rockefeller (1908–1979), Governor of New York and Vice President of the United States. His ashes were scattered on his estate. Christopher Reeve (1952-2004), actor best for his role of the title character in Superman and its three sequels. ^ a b Hu, Winnie (May 6, 2001). "For Chinese, Bliss Is Eternity in the Suburbs". New York Times. ^ "Taiwan Quick Take". Taipei Times. Jun 14, 2004. p. 3. ^ Berger, Joseph (October 30, 2003). "An Epitaph for Madame Chiang Kai-shek: 'Mama'". New York Times.